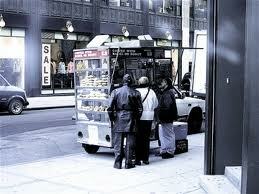 Most mornings on the way to work, I buy coffee from Nasir who parks his pushcart at the corner of 9th and Broadway. If you aren’t in NYC, picture a metal cart about five feet across, six feet tall and two feet deep that contains not only the proprietor, but coffee/tea/racks of jelly donuts and bagels, cups, ice and a heater to keep him warm in frigid temps. This morning I noticed that Nasir had really slimmed down. “How do you stay that way?” I asked, while inhaling the fragrance of a just baked croissant. “Let me tell you,” he said. 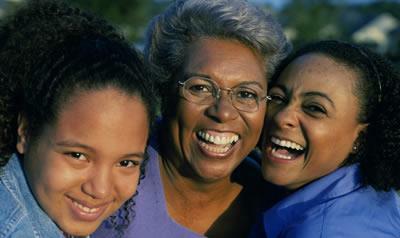 “Last year, I went to the doctor and my cholesterol was 247 and he warned me to exercise or else. So I started to park my pushcart on the sidewalk earlier and then run back and forth between 8th and 9th street. First I could only do it once. Then 20 minutes. Now I run a 100 times back and forth every day and my cholesterol is down to 140.” So every morning at dawn, he runs…and it began one block at a time. Nasir’s story made me think of the God Box. I’ve heard some people say, that it’s hard to remember to put a message in. I know it’s hard for me, and actually I imagine it’s easier just to keep on worrying and noodling things in my head. (For hours! Why does that make sense?) But if I think of it, as one note at a time, maybe I could learn to ask more often and feel that relief of letting go. One block. One prayer. One smart coffee pal of mine. One month. 6,000 books already sold. And almost as many undone to do’s. First, the good news! “The God Box” launched exactly one month ago today and it is flying off the shelves, both in stores and online and off– an amazing start. Mom’s little box seems to be touching so many and we hope that those who received it as a gift for Mother’s Day yesterday might want to buy copies for friends, family and just anyone who needs the love tucked inside. I traveled to Philadelphia (multiple times), Charlotte, Portland, OR, Pittsburgh, Chicago, and of course, held a bunch of NY events, spoke to at least 25 different audiences, visited bookstores to sign, tweeted, FB’d, blogged, appeared on a dozen radio shows and a couple TV programs, logged thousands of miles and breathed a couple of times. We are so excited and raring to go! Now, the bad news of what it means to go on a book ‘tour’ of my own design. (Aren’t we our own worst boss?) Here is the list of what I haven’t done for a solid month. So, starting today, for the next phase of what I hope is a lifelong journey with “The God Box”, I went to the gym, made the bed, sat with Rocky, ate oatmeal with skim milk(ok, it’s a start), and had a great night’s sleep. Still stuff on the list but don’t we all have that? What’s on your to do list? Do you believe that things happen for a reason? I do. Yesterday I started the day in overdrive. The book is one week from its official launch date and my head was spinning with undone “to do’s.” Did I finish revisions to my play script in time for my mid-day rehearsal? Did I remember to send advance books to friends? Did I write my Monday post for theGodBoxproject.com? No, no and no. And the big question, did I have a pair of sparkly shoes that would save me from hemming my new dress that I planned to wear to the kickoff at the Coaches Vs Cancer Gala in Philadelphia this coming Saturday? No time. Shoe store closed till 10am. How to fill the precious seconds? Every Monday, Union Square Park, right near our apartment, becomes a wonderful farmers’ market—flowers, fruits, vegetables. With the book in full bloom, I hadn’t visited it for a while, so I thought I’d walk around and sniff the goodness till DSW opened. That’s when I met Etta. I had stopped at the wheatgrass stand. I don’t have a cat. I can’t believe people drink the stuff. I buy it as ‘grass decoration.’ (Don’t laugh, it’s only $3 a patch.) But this lovely older woman chatting with the wheatgrass guy, and she looked at me and said, “You have beautiful eyes.” Huh? Only my Mom would have said that to me. “Do you have a juicer?” she asked. “No, I don’t drink this,” I said. She was appalled when I said that I only bought it for its looks. “Give her a shot,” she said to the vendor. “This is Stewart, I am Etta.” And she handed me a plastic shot cup of green liquid. “This tastes like grass,” was the best I could offer. “Gets rid of toxins, swirl it around and it’s good for your gums, good energy!” she grinned. Etta and I left together, talking and laughing. A new friend. She kept turning to smile and wave as she walked off. Me, too. 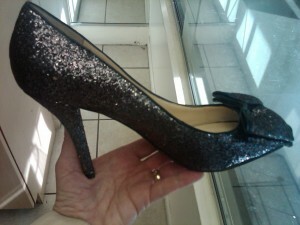 And I walked back to the shoe store and bought these even though I was already happily walking a foot off the ground. Was it Etta? 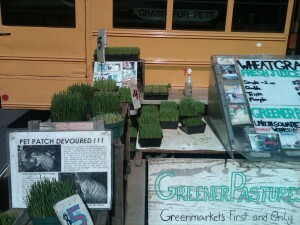 The wheatgrass chaser? Or…Mom? 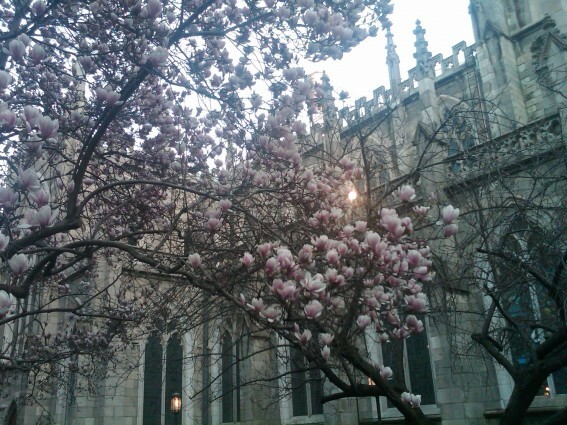 Springtime inspiration viewed from my NYC window…. So I added my photo to my on @Pinterest here. Join me there. This morning I walked around London for hours and hours with Joe. 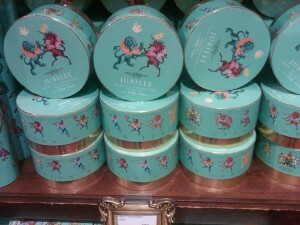 While on foot, I snapped a photo of these beautiful robin egg blue truffle boxes at Fortnum & Mason. They were made for the “Diamond Jubilee” to mark the Queen’s 60th year of reign of the Monarchy. I figured, why not eat truffles today?! 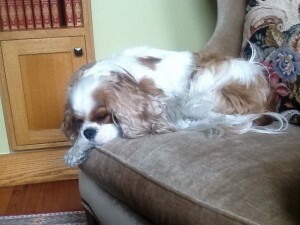 A day of rest should be indulgent, don’t you think? (And I did walk for miles…).